On 8 February 1942, the first Japanese troops landed in Singapore via the northwestern coastline. This marked the beginning of the Battle of Singapore between Allied (mainly British Commonwealth) and Japanese forces. After a week of intense fighting, the British Lieutenant General Arthur E. Percival surrendered Singapore to the Japanese forces under the command of Lieutenant General Tomoyuki Yamashita on 15 February 1942. That fateful day was also the first day of Lunar New Year. 75 years has gone by. Let’s take this time to look back by visiting The Battlebox at Fort Canning Park. The Battlebox at Fort Canning Park sited below the old Fort Gate, was re-opened in late June last year after undergoing a major makeover. We reached the Fort Canning Park at around 10.30am and headed straight to the Battlebox Visitor Centre to get our tickets for the 11 am Battlebox guided tour. All visitors are requested to complete their particulars (name, nationality and e-mail address) in the visitors’ book and I noticed that we were the only Singaporeans in the tour group of 10. So what is the significance of The Battlebox? 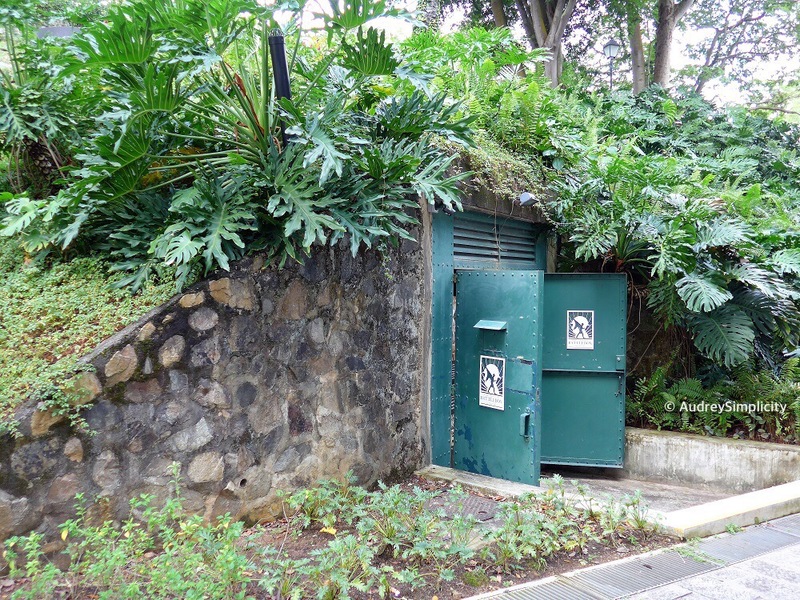 The Battlebox is a former WWII British underground Command Centre inside Fort Canning Hill, a network of bunkers and tunnels constructed in the late 1930s. It was part of the headquarters of Malaya Command, the army which defended Malaya and Singapore in WWII. It was inside the Battlebox where Lieutenant-General Arthur Percival and his commanders ultimately decided to surrender Singapore to the invading Japanese on 15 February 1942. The Battlebox tour is A STORY OF STRATEGY & SURRENDER™, the tour tells two stories – the fall of Malaya and Singapore in WWII, and how an underground command centre functioned during the war. Our tour was guided by Kamaliah, a young Malay lady, who gave us an overview of the tour at the Visitor Centre, before leading us to the Battlebox. Inside the Battlebox, Kamaliah started the tour by sharing with us on how Singapore or Singapura was founded by Sang Nila Utama, a Srivijayan prince from Palembang. Then she led us through the various rooms in the bunker like the Cipher Room where messages were decoded, Signal Control Room, Plotting Room where the locations of friendly and hostile aircraft were being mapped, Commander’s Room and Centre for Anti-Aircraft Defence where the surrender discussion was held on the morning of 15 February 1942. The Bunker also had its own telephone exchange and ventilation system that recycled the air. In the bunker, I visualised how it was like 75 years ago. Three hundred soldiers squeezing in a hot and humid bunker, not knowing what will happen next, thinking about their family and loved ones. Resources were limited, could at most last for a day, and pressure from the Japanese troops, a decision has to be made. Kamaliah touched on the military prowess of Lt-Gen Tomoyuki Yamashita and the Japanese army. She emphasised that the fall of Singapore was inevitable and that Lt-Gen Percival had little choice but to surrender. That must have been one of the most difficult decisions that Lt-Gen Percival has made. I am glad that Lt-Gen Percival was invited to witness the signing of the Instrument of Surrender by the Japanese on 12 September 1945, marking the end of Japanese Occupation in Southeast Asia. I will not provide too many details here that you may get the first-hand Battlebox experience at your visit. Coming to the end of our tour, we were led to the Cat-Ladder or Escape Hatch, the secret escape route. If you are wondering if we left the Battlebox via the Escape Hatch, the answer is no. We will probably be stuck and could not “escape” if we did that. We left the Battlebox via the same way we entered. This little “house”, next to the Fort Gate, was built in the recent years to secure the Escape Hatch underneath it. The tour is about an hour with the option to spend another fifteen minutes inside the Battlebox to go through the exhibits again accompanied by the guide. No photography is allowed in the Battlebox. It is a well-curated tour with great narratives. I am not a fan of history and did badly in my History subject when I was in school. If history was being taught this way then, I am sure I would have done much better on the subject. I would encourage fellow Singaporeans to visit The Battlebox to better appreciate our country’s history and why the fall of Singapore was inevitable. After my visit, I had a better appreciation of the Battle of Singapore and what the Allied forces went through. For foreign visitors, The Battlebox is a good place to learn about the history of Singapore, not just on the Battle of Singapore but also in the era of the Malay kings going back 700 years. After our tour at The Battlebox, we explored the Park, capturing what was left of the Fort. From the Battlebox Visitor Centre, our first stop was the Sally Port which led us to the Fort. So what’s a Sally Port? Sally Ports are small doors which lead in and out of a fort, allowing defenders to enter and exit undetected in the case of attacks. “Sally” means to make a sudden vigorous exit. In the past, there are at least three of such sally ports but now, this is the only sally port that remains standing. After taking the flights of stairs up from the Sally Port, we reached the Fort Gate. This gate and its adjoining wall are all that remain of the fort which was built between 1859 and 1861. The hill was previously known as Government Hill but was renamed to Fort Canning Hill when the hill was converted into a fort. It was named after Viscount Charles John Canning, Governor-General and the first Viceroy of India. On the way down the Hill, we saw the Nine-Pound Cannon. The cannon had become obsolete as weapons of war even before Fort Canning was built. It was just displayed as decoration and fired only for ceremonial purposes. Next, we came across this terrace, regarded as a keramat (tomb), an auspicious place where some believe they can ask for favours from the supernatural. 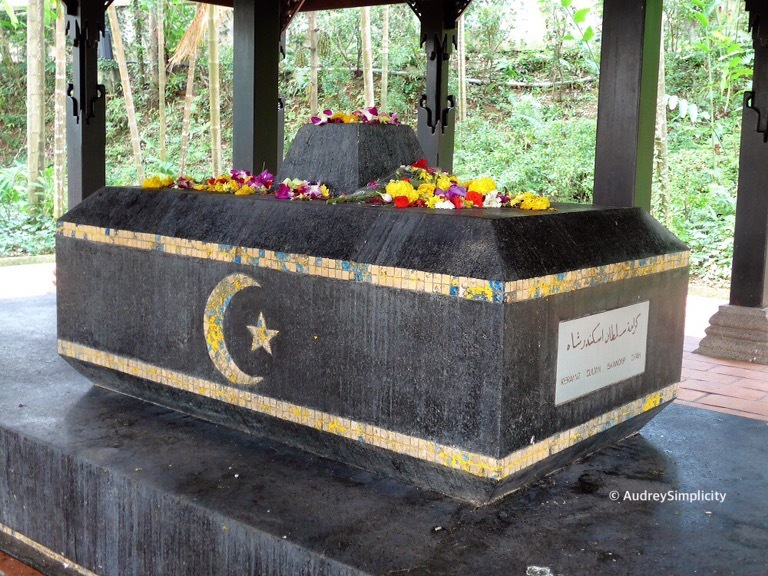 It has been claimed that this is the burial-place of Sri Sultan Iskandar Shah, the last of the five kings who ruled Singapore during the golden age of the Malay Kingdom in the 14th century. As I stepped in and got closer to the tomb, the fragrance of the flowers on the tomb filled the surrounding air. Wonder who left the flowers on the tomb. 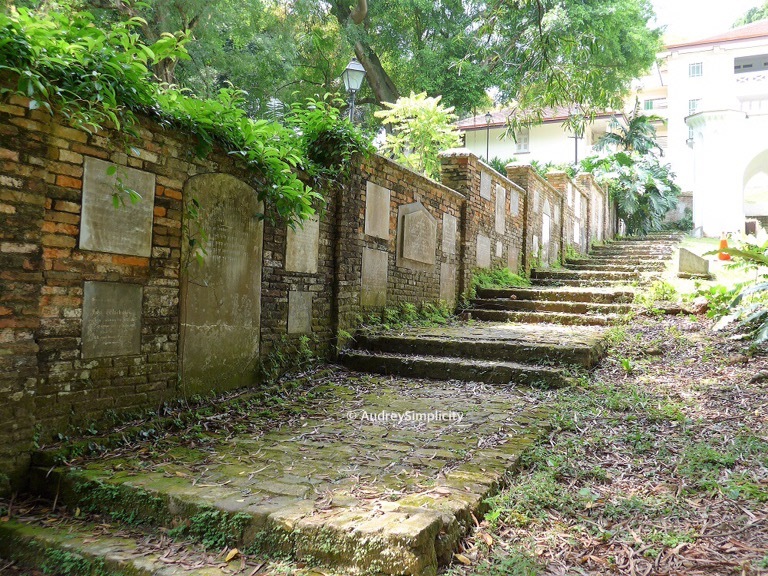 Our last stop was the Fort Canning Cemetery that is enclosed by the Gothic Gates. It is not unusual to see couples having their pictures taken in front of the Gothic Gates after they registered their marriage as the Registry of Marriages is located next to the Park. This is the first of the three series on looking back at The Battle of Singapore – Heritage Trail. Stay tuned for my next post on my visit to Bukit Chandu. Getting there: Alight at Dhoby Ghaut MRT Station, Exit B. Walk to Park Mall, which is currently undergoing demolition. Turn left just in front of Park Mall and walk down a narrow pedestrian walkway all the way to its end. At the end of the walkway, walk up the pedestrian ramp in front to an underpass. Cross the underpass and go up the Spiral Staircase. At the top of the Spiral Staircase, turn right and head straight up the flights of stairs to Percival Road. There is a roundabout at the top, next to the Hotel Fort Canning. The Battlebox Visitor Centre is in front of the roundabout. The Battlebox is a short walk away from the Visitor Centre. If you are driving, the nearest car park is Carpark B. Do have your parking coupons ready, it is at $1.20 per half an hour. Photography: No photography is allowed inside The Battlebox. Time Required: Set aside an hour and thirty minutes for The Battlebox tour and another thirty minutes to an hour to tour the Park. For more information on The Battlebox, go to www.battlebox.com.sg/. Access to the Fort Canning Park is free. For more information on the Park, go to https://www.nparks.gov.sg/. Yup, that was being discussed at the Battlebox tour. I would highly recommend that you take half a morning to visit The Battlebox, I am sure you will enjoy the tour. Heheh, Mel heard about this when back in reservist…but yes we will, and the walk the southern ridges too!